Rottnest Island Perth Western Australia, is the must see playground of Western Australians. Rottnest Island has sheltered beaches no matter what the wind direction. Most boats to Rottnest depart via Fremantle or Hillarys boat harbour. Rottnest Island is 18 kilometres from these Perth harbours. It's about half an hour by road from the Perth CBD to these Perth harbours. Plane flights from Perth to Rottnest is an alternative. Private sailing yachts and charter boat are an alternative to the fast Rottnest Island passenger boats. Pure white sand beaches at Rottnest are protected by from sun and wind by limestone rock outcrops. Beautiful bays of clear Indian Ocean teaming with fish. Fishing Rottnest Island reefs, beaches and game fishing west of Rottnest Island on the edge of the continental shelf is world class. Perth fishing charter boats, private fishing boats, fishing club contestants all enjoy good recreational sport fishing around Rottnest Island. Spear-fishing Indian Ocean zones off Rottnest is restricted in designated areas. 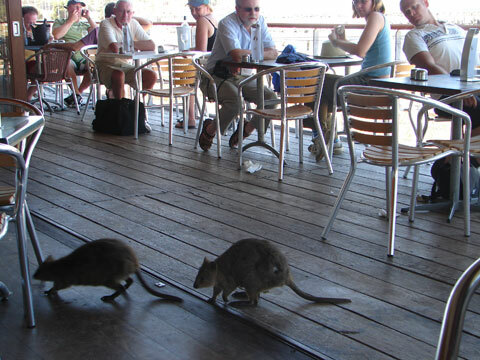 There is a variety of accommodation on Rottnest Island and in different locations. Most Rottnest accommodation is near Thompson Bay, a sheltered east side bay where most boats approach Rottnest Island from Perth and anchor. Some for party central. Accommodation at Geordie Bay is sheltered from the early summer strong south westerlies. Boats moored near Rottnest Island accommodate hundreds of Perthites in summer. SCUBA diving is a popular at Rottnest. There are large underwater caves full of fish. Rottnest Island also has an historic SCUBA trail which connects various points of interest such as shipwrecks. There are numerous Perth based, Perth to Rottnest Island charter boats which run CUBA diving trips to Rottnest Island. Surf at Rottnest Island is about 4 times bigger than surf at Perth Beaches. Surfing at Strickland Bay this morning inspired me to put this webpage about "Rottnest Island" together. I'm used to surfing a beach break at Scarborough Beach. The last reef break I surfed was at Hikkaduwa in 1976 so there was some fear which dissipated with the first wonderful ride. I didn't know when to stop and went almost to the beach. When I got off the wave I was standing on the seaweed covered limestone reef. The surf rolls in at Rottnest Island from the Indian Ocean, giving PLENTY of time to get surfing. Even if you wipe out, there's plenty of water between surfers and the reef. "Mills Charters" do fishing and surfing tours to Rottnest Island surf spots out of Hillarys Boat harbour or from the port city of Fremantle. 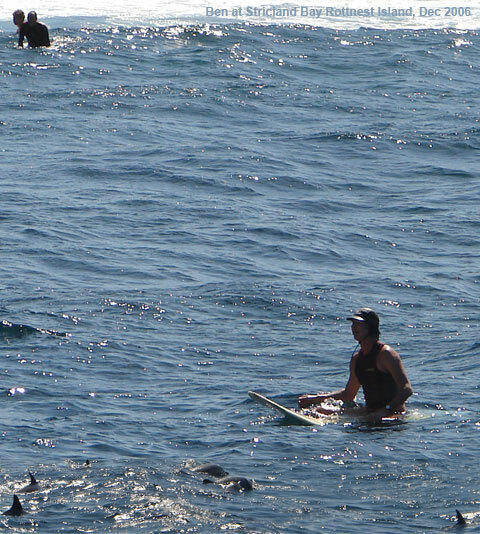 12th December 2006, I got to surf with a pod of surfing dolphins at Rottnest Island. 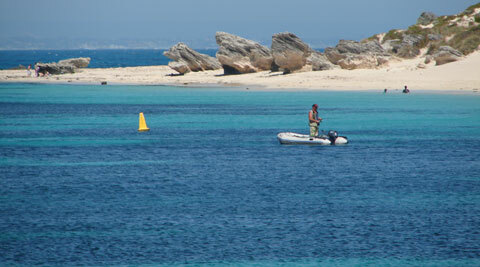 Kitesurfing and windsurfing at Rottnest Island are also popular. I had my first "pash" at Rottnest with an exciting, young beautiful Perth girl "Loverock" older than me circa 1967 in a tent at the Rottnest Island camping ground known as "Ten Land". There are many bungalows but because Rottnest accommodation is very popular you need to book MANY months in advance if you want accommodation at Rottnest in peak summer season. You wanted to leave tents on Rottnest open and inviting for girls to visit but if you fell asleep, little furry creatures which look like big rats, would get in a eat your food. Rottnest Island quokkas are the reason early Dutch sailors gave the island the name (rat) Rott-nest. There are food stores and restaurants at Rottnest. The Rottnest Island bakery is worth waiting for breakfast. A fast ferry boat from Hillarys boat harbour to Rottnest Island departs at 9am and returns to Hillarys boat harbour, Sorrento Perth at 4pm. Snorkelling equipment and lunch is included in this Rottest Island day trip. Bicycle hire on Rottnest is popular. Charter plane from Jandicot airport or Perth airport are travel options to Rottnest Island. Private cars are not permitted on Rottnest Island. You can bring your bike by boat or hire bicycles from near the Rottnest Island Hotel.